I have over a decade of experience in brokering real estate transactions, 28 million in sales and completing several episodes of HGTV’s show “Hawaii Life” and a “House Hunters” episode, I am ready to get to work to sell your property! I hold a bachelor’s degree in computer graphic design and over a decade of hands-on experience creating successful marketing materials for listed properties. My passion for real estate photography has complemented my graphic design skill to create a complete package for listing properties, with proven results. When I am not selling real estate, you can find me on the tennis court or the beach - cheering on my husband and surfing champion daughter. I am fortunate to have roots in Satellite Beach, Florida and Kauai, Hawaii. I graduated from Satellite High School and the University of Central Florida. I maintain a vacation home on the island of Kauai and live here in Satellite Beach. 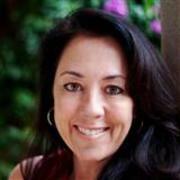 I am a licensed Real Estate Broker in both Florida and Hawaii. If you have a property to sell or wish to buy a property give me a call - who knows, you may see yourself on a future HGTV show!